This easy recipe for brown sugar salmon takes just a little bit of sweetness and makes it go a long way. Get ready for them to ask for seafood seconds! It’s amazing how just a little bit of certain flavors can totally transform a recipe from ordinary to oh-my-gosh, can I have some more? Take this simple little recipe for brown sugar salmon, for example. 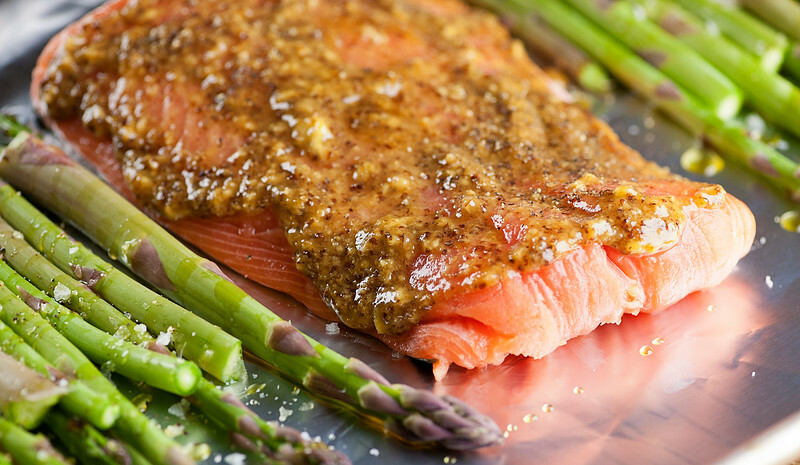 A simple little topping made out of brown sugar, mustard and a few other things spread on top of a salmon filet takes a regular ho-hum piece of roasted salmon and transforms it into a plate of sweet and savory mouthwatering deliciousness. Ready to get some delectable and easy seafood onto your supper table? Let’s make it! The Southern husband and I are pretty selective when it comes to eating sugar (except on birthdays, vacations and Christmas when all bets are off! ), so if we are going to include it in our regular day-to-day, it has to be just a little bit and it has to pack a big punch. This recipe calls for just 2 tablespoons of brown sugar for a whole pound of salmon, which you are going to whisk up with mustard, soy sauce, chopped ginger and a little olive oil. Slather that all over a nice piece of salmon filet. I like to toss a whole bunch of asparagus on to the baking sheet, because both the salmon and the asparagus take exactly 12 minutes to roast, which seems like they are meant to be together. Yep, 12 minutes later you are going to be dividing this lovely piece of brown sugar salmon between dinner plates, and sprinkling it with chopped scallions to give it a little sass. We also like to splurge on some salmon caviar (also sold as salmon roe in your seafood section) which is WAAAAAYYYYY cheaper than regular caviar and gives this dish a little salty pop. Totally optional, but fun! So if you are going to splurge on a little sugar in your supper, here’s our favorite way. You only go around once! Stir brown sugar, mustard, soy sauce, ginger and 1 tablespoon olive oil together in a small bowl. Place the salmon on the baking sheet. If it has a thin end, tuck that end underneath so everything is pretty much the same thickness. Place the asparagus on either side of the salmon. Spread the sugar mixture over the top of the salmon. Drizzle the asparagus olive oil and sprinkle with salt. Place the sheet in the oven and roast for 12 minutes. 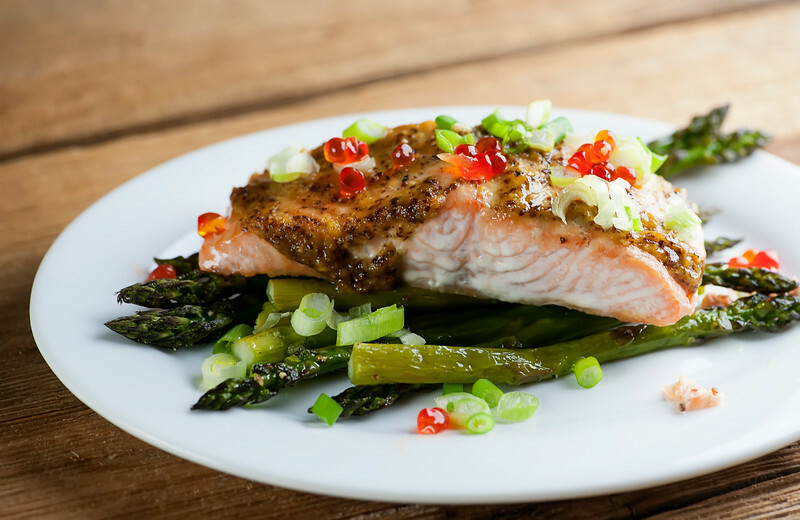 Divide salmon and asparagus between plates, garnish with chopped scallions and caviar and serve. I always thought salmon was a fussy dish to make and have only recently been brave enough to try my hand at cooking some. It’s a lot easier than I thought! I take the boring route of just olive oil, salt and pepper for my roasting. This will definitely jazz things up a bit! Can’t wait to try it out! Oh my God, this looks so impressive and delicious! I have to make this recipe, I love salmon and asparagus! This came out really well. I had 1 3/4 lb. of salmon so I nudged the other ingredients up to scale it. I’ll definitely be making this again. Thanks! Hi Pat! We are on a salmon kick these days, and this one is in regular rotation at our house. So glad you liked it!